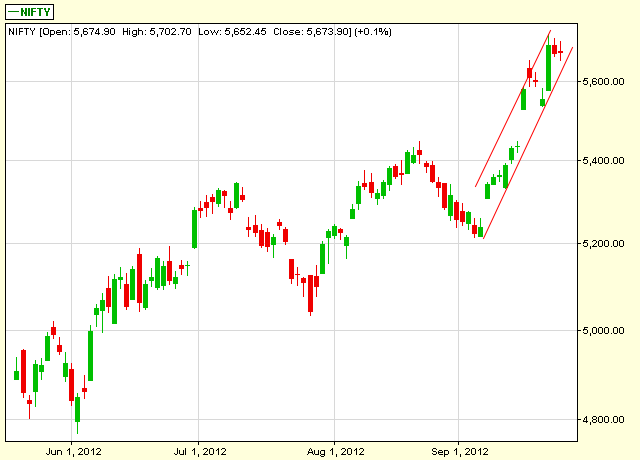 Nifty is trading at top of red upward channel and and closed making spindle tops as seen at 4 year weekly chart . now 5720-5730 is crucial for Nifty spot ....above it upside targets 5976 - 6230 in next 90 days . On daily chart we have observed shooting star candle which may support bears ..
30 Minute chart is showing range break out and closing just above top of channel ...will old channel try to pull in prices below 5700 ? trading at top of the channels on daily and weekly charts..
FIIs invested Rs 20807 Cr in Sept 12 :Third time above 20k Cr since Apr 2006. FIIs fund inflow in Sept 12 was Rs 20807 Cr , third highest monthly inflow since Apr 2006. 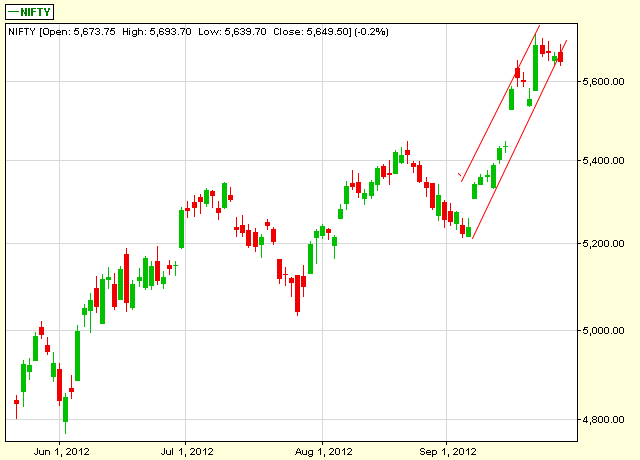 Nifty is consolidating in range of 5640-5690 since Sept 21 ...will we see break out / down today ? Positive to gap up opening is expected with volatility ahead ...Bulls are able to sustain above 5630-5650 band and settle Sept series at quite positive note . Oct series is welcoming . Trade according to trend ...and strict stoploss. 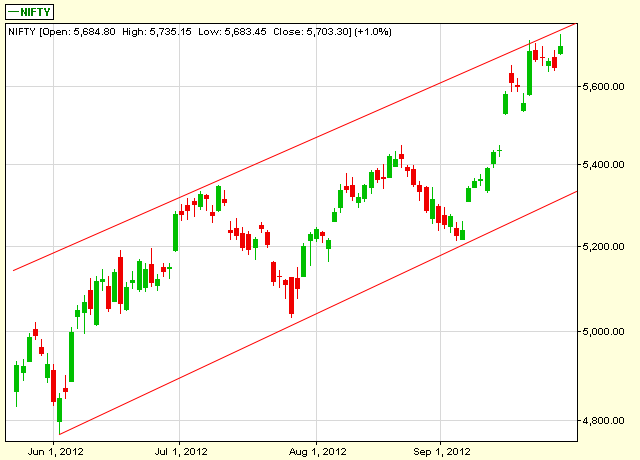 Will up trending channel pull nifty in it which was slipping down ....?? 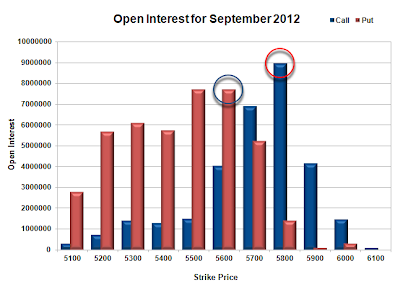 will we see profit booking today at higher levels ...after gap up ? Nifty is consolidating in 50 points range since three and half sessions so we are expecting break out / break down either today or tomorrow .Be alerted and mint money during range/channel breakout . can u imagine 10 thousand can be earned in a day doing multiple trades on investment of 50 thousand ....? 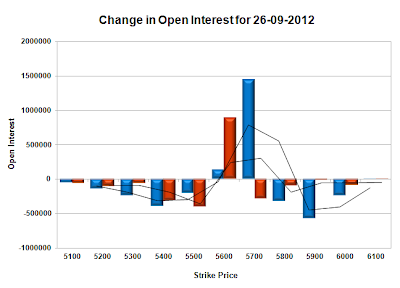 but it is possible ..
Kapoor (9/26/2012 4:41:54 PM): isme brokerage katega..
Where Nifty will chettle todayy ????? 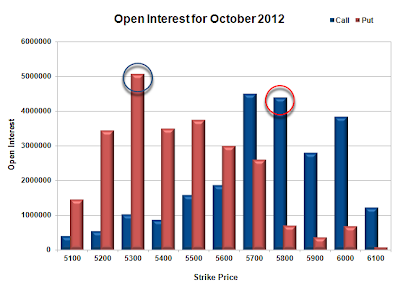 OI table of options is indicating that maximum call writings are at 5700 and 5800 levels and maximum puts were written at 5500 and 5600 level so we can assume that market may move towards 5600.and 5630 -5650 support band may break today. 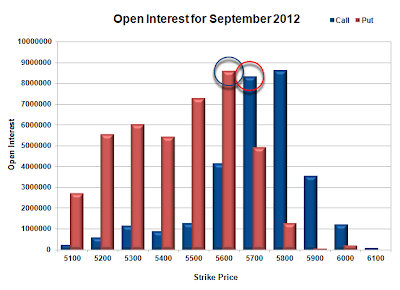 Premium calls of 25 Sept 12..
how to decide this is entry point?